- Sovereign, Independent, self-sufficient, strong culture, traditions and having an inherent belief in the goodness of all nature had to offer. - Many tribes, nations and diverse language, differences in dress, homes and use of natural resources. Initially welcomed the Newcomers - willing to share earth's resources including the land. - Trade in and amongst themselves was common. - Europeans wanted to trade their trinkets for furs, meat, pemmican, canoes, and many other offerings of the Indigenous people. - European traders took advantage of the trusting hearts of the First Peoples. - 1497 - John Cabot lands at Newfoundland. - 1534 - Jacques Cartier led three voyages into the Eastern part of Canada. - 1576-8 - Martin Frobisher explored the Arctic meeting the Inuit. - 1608 - Champlain founds Quebec. - 1611 - Henry Hudson lands in James Bay. - They found a rich fertile land filled with the bounty of all things natural. - European market demand for furs, especially, made traders less than scrupulous and greedy for more and more, thus depleting the wildlife. - The Indigenous people wanting to please the traders and liking their trinkets killed beyond their need. - Treaties 4, 5, 6, 8, 10 cover all of Saskatchewan - OTC (The Office of the Treaty Commissioner - 1989) helps both the government and the Indigenous people come to a common ground of understanding and implementation of these treaties. - We all benefit from the Treaties - Indigenous benefit from our promise that they will continue to be able to provide for themselves. Our (white people) benefit is that we are able to purchase land and use it. - No written agreements but were told in story form. Agreements were made ceremonially through pipe ceremonies (symbol of truth and honesty). - The spirit and intent of those entering into the commitment of their treaties should be honoured. The Creator was their witness, too. - Indigenous people wanted to be integrated into the new society that was occurring in Canada. - They did not sign on to be assimilated, especially not coerced, forced, or tricked. - The Indigenous people had their livelihood taken away from them. - With an exploding population arriving and taking ownership of their lands they had fewer opportunities to hunt and gather as they had for eons before. 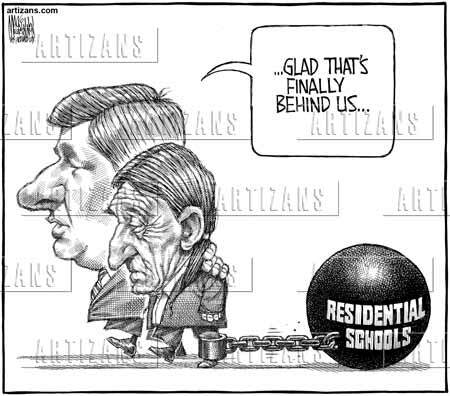 - Residential Schools were formed to assimilate Indigenous children into EuroCanadian culture. - To erase everything "Indian" from their known history, including their language. - Five years of Indigenous Peoples stories and experiences shared with Justice Murray Sinclair. - The most important part of this comprehensive study are the Calls to Action. - These will help all of Canada to start the process towards healing and reconciling the wrongs meted out to the Indigenous Peoples. - Regina Indian Industrial School Cemetery – an artistic endeavor to recognize and own our collective responsibility, as non-Indigenous people, for the injustices both past and present to the Indigenous people of our nation. - TRC Call to Action 10 calls for the “development of culturally appropriate curricula and for respecting and honouring the treaty relationship”. - TRC Call to Action 63 calls for “understanding, empathy, and mutual respect... identifying teacher-training (sic) needs related to Aboriginal education issues.”. - All of these the University Faculty of Education is addressing. - 40 pages of stories, documents and other items of interest to understanding what happened during Residential School years. - To understand the intergenerational effects among the survivor’s children and grandchildren. - Northwest Territories and Nunavet now have government mandated curriculum so that high school students learn about the legacy and history of residential schools. - Lessons start at before contact with Europeans, then move into the delicate subject of abuses and purposes of residential schools, then end with hope and opportunities for healing. - storyteller extraordinaire, who commiserates about life before residential school while contrasting it with the coldness of the residential school he attended. I love how much detail you give in your posts. For myself, I look forward to what you have to say because it seems you put a lot of thought and consideration into what you post. Thanks for the great representation of your learning! Tanya, you have a lot of information that is very insightful! I am curious of whether or not you had ever heard of Project of the Heart ,or any other organization that is trying to promote reconciliation, before this class? Tanya, you have a lot of information that is very insightful! I am curious of whether or not you had ever heard of Project of the Heart ,or any other organization that is trying to promote reconciliation, before this class? I had only heard of the Witness Blanket quite recently when a couple of Indigenous Teachers from my school went to see it. I did not hear much about it and thought that it was a traditional cultural thing. However, I diod not realize the significance until I was introduced to it through this topic.Nor was I aware of any other projects to help with reconciliation before this topic. I feel these and other projects as they come are helping us settlers to understand why we need to reconcile and giving us the ways and means to do this. You continue to engage so much with all the material presented and then represent and share with your group in such a meaningful way. We all learn from your detail and genuine love of learning. ​Orange Shirt Day has become a new event in many schools across Canada to acknowledge Residential School survivors as well as the children who did not survive the ordeal. Their slogan of "Every Child Matters" is one that speaks the truth. My questions are, how can we keep discussing and teaching about Residential Schools and the inter-generational effects they have had on First Nations people without trivializing it or making it, as one woman said in a previous video, a "souvenir", that is talked about and shown off until the newness wears off and then left to "collect dust" again. Is Orange Shirt day enough to start and keep the dialogue, teaching and learning going? Or is it making a “souvenir” out of this dark portion of Canadian history? I believe this is a new concept of expressing reconciliation since 2013. It does take a bit to catch on across Canada. Yes, Taryn, the day of remembrance must be introduced with appropriate teaching on why Phyllis Webstad's brand new orange shirt that her grandmother gave her was taken away by these 'new people' in her life. There are some excellent books for children about residential school experiences. Charlene Bearhead was interviewed by CBC and shared that children, even as young as kindergarten will learn about this. Great correlation between the concepts of the Pink Shirt Day and the Orange Shirt Day and how it could have less of an impact as the years go by. However, I have found that in the school system, at least in the Catholic System here in Regina, Pink Shirt Day is a big deal every year. The children become more and more aware of the significance and the strength of standing up for something. If it had not been for the Pink Shirt Day and the revisiting of its significance do you think our nation would have moved so far forward on LGBTQ issues? To embrace these symbols of what needs to be defended and help us become more aware and knowledgeable as the years go by, even if it is only for that day or week of the year, is better than forgetting about it totally. I believe schools will continue to teach tolerance and acceptance, forgiveness and recognition for a long time. Both the pink shirt and the orange shirt days will help this happen. Everyone has made some great points. I agree that if a school were to participate, that it should be given the respect the event deserves and should not be taken lightly. I also agree with the idea that it may become just another day to wear a colour... like some kind of 'spirit day' for school. That thought worries me. I have seen in some schools how the Pink Shirt day is just another day to dress the same, it has lost it's meaning in some schools/classrooms. But it does depend on the school and how they embrace the idea of Orange Shirt day and educating in the subject. If the meaning behind the event is taught, then I think Orange Shirt day will help in making awareness and creating an understanding on the road to reconciliation. Below is a picture of a cartoon displaying former Prime Minster Stephen Harper and an Aboriginal leader walking together. What do you interpret from this visual? How does it make you feel? Do you think this picture holds some truth? Through my journey of learning this week I found that reconciliation is vital for Canada. What do you think teachers could do to help enforce reconciliation in the classroom? Have you noticed any attempts of reconciliation at the school you are currently at for your field placement? In what ways could you honour reconciliation? Do you think there has been some resistance for reconciliation from non-Aboriginal people? If so why? When I see this cartoon I see the 'white man' oblivious to the ever-present burden that history has left on generations of Indigenous people. It is interesting that the sufferer shows signs of grief and hardship while the white man's complexion is seemingly youthful and without a care in the world. The 'white man' seems to believe his hands are clean of any further responsibility or even the ability to empathize. A very patronizing supportive role. What do you think teachers could do to help enforce reconciliation in the classroom? I think teachers and administrators can hold an Orange Shirt Day each year and set aside at least a day - or a week, to exclusively learn about Residential Schools in a grade appropriate manner. Have you noticed any attempts of reconciliation at the school you are currently at for your field placement? At the school where I am placed there is no evidence that I have seen that teach about reconciliation. I am going to ask this Thursday if they recognized orange shirt day. In what ways could you honour reconciliation? I think one of the best ways to honour reconciliation for me is to learn all I can about residential schools, reconciliation and about Indigenous culture and language. Do you think there has been some resistance for reconciliation from non-Aboriginal people? If so why? There will always be those who are naysayers. Those who believe that we are already giving them a free ride. However, I believe media can go a long ways to helping society reconcile the truth within themselves. We need to ask why are our jails filled disproportionately with Indigenous inmates? Why are Indigenous people carded often? Why are employers not hiring Indigenous people? Why are we stereotyping them as no good, worthless drunks? Why are we not ashamed at how we are thinking sometimes? I believe that it takes a lot of collective strength within the Indigenous community and society as a whole to not only overcome these stereotypes and prejudices but to rise above and accomplish something for themselves and their families. They need us to help them. We need them because they will help us to rise above our own platitudes and haughtiness. Tanya, great comments I agree that we need to help each other for different reasons. I also loved how you commented on the appearance of Stephen Harper and the Aboriginal leader. I can tell that you paid attention to many details in the picture, so thanks for taking the time to do that! Since I know that you are a bit older with children, I was wondering if you have seen a change in how people treat Aboriginal People from your generation to younger generations? Do you see progress? I hear many white people of my generation or older who still harbour outmoded negative notions towards Indigenous people. I do wonder if this attitude transposes to include other races as well? I remember when the Indigenous people moved into north central (there has been talk of establishing Regina's first urban reserve). This was about the mid '80's. Before 1985 there were not too many Indigenous people in Regina for they still had restricted mobility outside their reserves. Before this time the area was quieter and no noticeable spikes in crime. However, since then it quickly got run down and it is as it is now. I work in an inner city school and it has a high Asian population as well. I find the children see each other on a fairly equal basis. I am surprised and grateful that my prejudices before starting there have been dispelled. The children are well-behaved, considerate and respectful of each other. The staff are for the most part very gentle with them and I feel the children are very well taken care of while at our school. My children have friends of all nationalities and colour/race is not noticed.